Nashville, Tenn. (Jun. 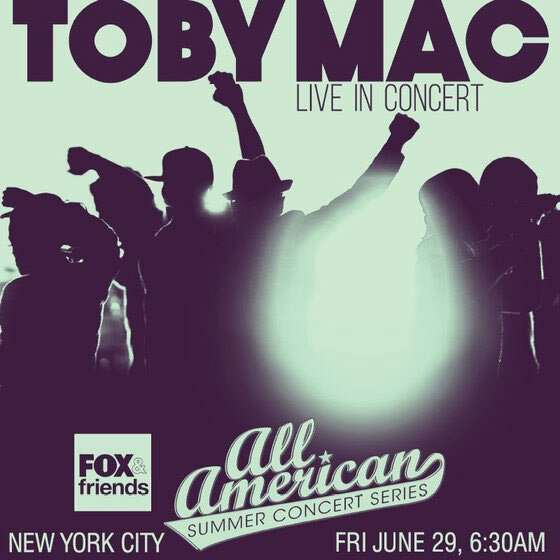 26, 2018) – Multi-platinum selling artist TobyMac will be center stage at Friday’s FOX & Friends' All-American Summer Concert Series in New York City. “I just need U.” is among the hits he is scheduled to perform with the DiverseCity Band. The popular song marks the 7X GRAMMY® winner's biggest single in six years which soared quickly to the top of the radio charts and Billboard's Hot Christian Songs Chart. The morning show concert series also features Lynyrd Skynyrd, Phillip Phillips, Scotty McCreery, MercyMe and more throughout the season (for more information click here). With more than 11 million units in career sales and a whopping seven GRAMMY® Awards, TobyMac's career continues on the fast track. His most recent RIAA Certified Gold studio album, THIS IS NOT A TEST garnered a GRAMMY® Award, Billboard Music Award nomination on top of a high marking debut at No. 4 on the Billboard Top 200. Each of his six studio solo projects have achieved Gold certification, a first for any artist in the history of his label, Capitol Christian Music Group. Among those honored with Gold certification, EYE ON IT, which debuted atop the Billboard 200, only the third ever Christian album to do so. His previous live DVD, ALIVE & TRANSPORTED, is RIAA certified platinum and received a GRAMMY® award. HITS DEEP LIVE, TobyMac's newest LIVE CD/DVD is available now along with the most recent holiday collection, Light Of Christmas. TobyMac's latest single "I just need U." was released in early 2018, and is his biggest single in six years soaring quickly to the top of the radio charts and Billboard's Hot Christian Songs Chart.